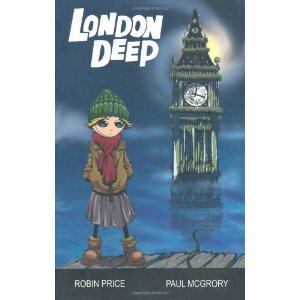 London Deep by Robin Price and Paul McGrory is story about a girl in a future where London is under water from global warming, and the APD (adult police) and YPD (youth police) compete to keep the peace in their watery new world. I was intrigued when the publisher (Mogzilla, U.K.) offered to send me a review copy. London Deep is half-novella, half-graphic novel, and this new format both fascinates me and caused some difficulty in reading it. Unlike some illustrated novels, the graphic illustrations (which are edgy and cool) in London Deep are integral to the story. Rather than enhancing the story, they are part of the story – if you skip them, you will miss out on a scene in the novel. This is intriguing as a way to draw in reluctant readers, without going to an all-picture format like a graphic novel. There are plenty of words in this book, and they tell most of the story. But switching back and forth between “story-as-graphic-novel” and “story-as-text-novel” had my brain doing flip-flops. And I discovered something about reading in the process. 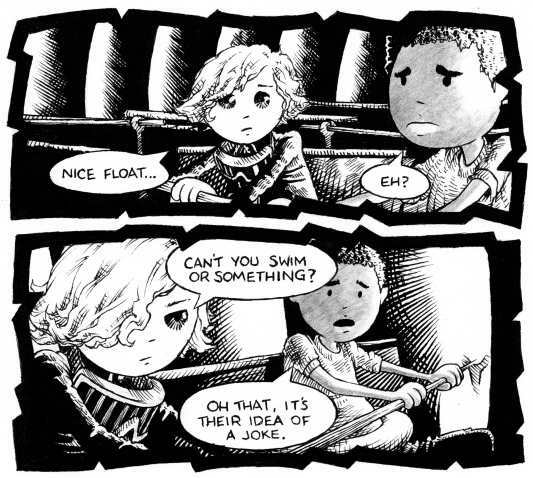 Graphic novels require your brain to fill in great swaths of story – much happens in between frames and you, the reader, are expected to fill in the blanks. Text stories carry you along more smoothly, with blanks left between scenes or chapters, in more easily anticipated jumps. Not only was it difficult to jump between text and comic art, but the text itself seemed to have a “graphic novel” feel to it, in that there were many blanks left in between sentences, for the reader to fill in. It may be my adult brain (or ‘Dult brain as protagonist Jem would say) had more difficulty with this than a young reader would. Beyond formatting issues, this was a cute story, with colorful characters and a rich future-world. Jemima Mallard, daughter of the Chief Inspector of the Adult Police, has a day that goes from bad (her houseboat sinks) to worse (losing precious tanks of air) to sunk (captured by the Youth Police, and then underwater terrorists). I’m still not quite sure how the YPD and APD came into existence, but perhaps that will be explained in the sequel Father Thames. The action is fast-paced, but the violence kept to a minimum, making London Deep an excellent read for reluctant readers ages 8+. There’s not a reading level designation on the book yet, but I would place it somewhere around RL4-5. My very favorite part actually was an ad at the end for another Mogzilla book, I Am SpartaPuss, a cat tale set in Ancient Rome. I may have to read that one next! That sounds fascinating! Now, is the author who wrote the dialogue for the graphic novel parts the same as the one who wrote the prose portions of the novel? Also, who is the artist? It would make the most sense for the author to be the artist…but I suppose a work like this could be produced by people working in tandem. Anyway, very interesting! @Walter Ack! Epic fail in attribution. I've amended the post. Artwork is by Paul McGrory and prose by Robin Price. I'm sure they worked together, but I couldn't say for sure who wrote the dialogue. Thanks for the catch! I wrote the story first and then Paul and I worked on the dialog during the edit. It would be great for the author to also be an artist but I believe me, no one wants to look at my art! Paul is an amazing artist and has brought the idea to life brilliantly with. Rather than constrict him, I encouraged him to bring his own imagination into the world – and tried to make it his vision. I had to lay down a few rules about how mechanical things work etc but apart from that, the visualization is all his. That seems really interesting. I'm curious what the reading experience would be like, juggling back and forth between two different story forms. Would there be a clash between the images provided and the ones my brain wants to create out of the word pictures provided in the prose? And I should mention that I love the title London Deep. I've always been a sucker for a good title. I've been piloting the use of graphic novels as adjuncts text (for my social studies classes). They are great tools for activating prior knowledge (pre-reading) or summarizing (post-reading) as well as introducing vocabulary words. The ones I use were created by McGraw Hill/Glencoe to parallel our seventh grade textbook. Both the advanced and reluctant readers are enjoying them. @Darby You are right, these can appeal to all readers, not just reluctant ones! Witness: Diary of a Wimpy Kid. And I should pass my copy on – maybe I'll have another contest to give away my review copies of books here sometime soon. I think I need to get a copy of this one! You've raised my curiosity!!! I'm intrigued. It might be something my 8 yo reluctant reader would like. Btw, what does RL4-5 mean? I've seen it on Scholastic book orders, but they don't tell you what it means. @Stina RL = Reading Level, RL4.1 is reading level of an average fourth grader in the 1st month of fourth grade. My estimate RL 4-5 means reading level of fourth and fifth graders. Now, you can have a 2nd grader with a RL4.5 – they are an advanced reader, reading two and a half grades ahead. More here.